The process of discovering new venture with creativity and innovation is called entrepreneurship. Entrepreneurship requires assumption of risk and reaping of awards. It brings resources together and provides option for self-employment to an individual. Entrepreneurship also creates employment opportunity for others. Entrepreneurship is a complex term that’s often defined simply as running your own business. But there’s a difference between a “business owner” and an “entrepreneur,” and although one can be both, what distinguishes entrepreneurship is a person’s attitude. Entrepreneurship is the key driver of a dynamic company and involves the recognition and evaluation of opportunities, where that means increasing the value of a existing product or service or creating mass markets with new technology. identification of the economic determinants of growth, at the levels of the venture, the region and the economy as a whole. Entrepreneurship is a mind set of creativity and risk taking. It is a process of identifying opportunities and bringing together factors of production to exploit these opportunities. 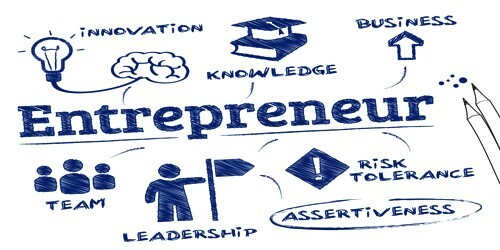 Entrepreneurship results in creation of new venture by planning, organizing, operating and assuming the risk. It always aims for innovation, profitability and growth. The entrepreneurial spirit has appeared as the engine of economic development. Entrepreneurship has resulted in millions of new ventures in the world. Entrepreneurship has appeared as the driving force for industrial and economic development. Therefore, the interest in the concept of entrepreneurship is growing in today’s world. It is triggered by four main factors, first of all, discontinuity: social and technological shifts (for example, the growth of broadband, or the growth of ageing populations) create challenges for policy makers but opportunities for entrepreneurs. Secondly, regulation can force new innovation, as environmental regulations created mobile phone opportunities with the opening of wireless spectrums. Technology is also an important trigger; the application of existing technology can lead to the development of a new industry and the solving of a problem in a way that is exploitable in terms of intellectual property. Finally, serendipity, or accidental discovery can encourage entrepreneurship, though it’s comparatively rare when compared with the gains made by small changes to supply channels. Entrepreneurship involves creating or discovering new ideas or opportunities for the purpose of creating value, whether economic, social, or even political – and forming a new organisation to do so. An entrepreneur is a person who practises entrepreneurship.